Margaret Garcia, DDS graduated from The University of Missouri in 1994. She moved to Maui with her husband Dean Arashiro (whom she met in dental school) and started her practice in Kihei in 1996. She is passionate about helping her patients achieve the highest oral healthcare possible and is focused on using the latest technological advancements to achieve the best results. 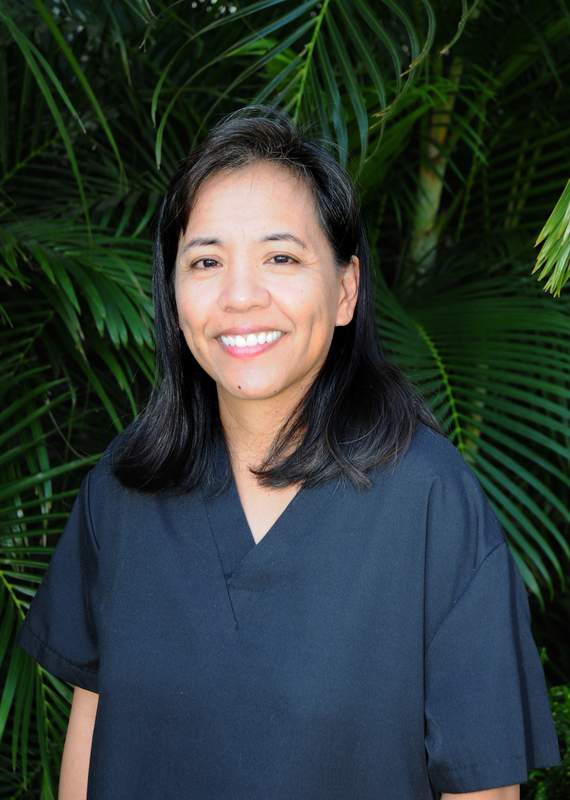 Dr. Garcia is a member of the American Dental Association, Hawaii Dental Association, Seattle Study Club, and MCDA which keep her up-to-date with continuing education courses. She is always on call to take care of her patients’ dental emergencies. When not at work, she enjoys spending time with her family, doing zumba, and playing tennis. She has a daughter and twin boys who keep her very busy with school activities and they enjoy golfing together. Nancy Castro is one of our dental hygienists for our office and has been working with Dr. Garcia since 2000. She is a graduate of the University of Hawaii at Manoa. Her goal is to help patients achieve a lifetime of good oral health through prevention and maintenance. When not at the office, Nancy enjoys relaxing at home, spending time with her family, and working out. Michelle Bolosan is the dental assistant at our office. She joined Dr. Garcia’s team in 2005 and enjoys assisting and helping patients feel as comfortable as possible while in the dental chair. She enjoys getting to know the patients on a personal level and helping them achieve a healthy smile through good oral hygiene habits. Born and raised on Maui, Michelle loves exploring her island home. In her spare time, she enjoys singing, baking, spending time with family and friends, and traveling around the world. She is also involved in a full-time international volunteer work here on Maui. Rica Matillano is the dental assistant at our office. She graduated from Maui High School. She started working for Dr. Garcia after interning in 2013. Rica loves helping patients and educating them about their teeth. In her spare time, she enjoys hiking, beach, camping, and most of all, spending time with her friends and family. Rica loves to travel around the world and especially explore the beautiful island of Maui. Shanelle Mae Domingo was born and raised on Maui. She graduated as a Certified Dental Assistant with directors honor roll in 2011 at Pima Medical Institute in Las Vegas. She recently joined Dr. Garcia's practice in January 2016. Shanelle strives on building patient relationships & finds it very rewarding to bring back confidence in a patient's smile by making them feel relaxed, comfortable & leave the office with a positive dental experience. Outside of the practice, Shanelle loves to go on new adventures exploring the beautiful Island of Maui & spending quality time with her family & friends. Christine Domingo was born and raised on the island of Maui. She graduated from H.P. Baldwin High School and moved to Oregon where she received her Bachelor of Science Degree in Dental Hygiene. Christine believes building patient-professional relationships is important to successful continuing care. She loves to see her patients leave the dental office happy and educated about oral hygiene. She enjoys spending quality time with her family and friends. On her spare time she enjoys hiking, snorkeling, watching the sunset, and volunteering her time at church and events.